Chiloe is with 9,600 sq km the second biggest island of South America, located more than 1000km south of Santiago in the Pacific Ocean. It is a hilly and green but harsh land with more than 2200mm precipitation per year. 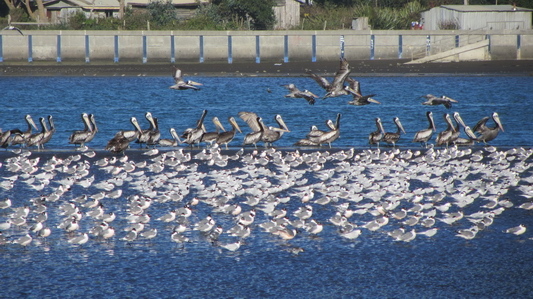 Most of its population live in the two bigger towns Ancud and Castro, which have about 20,000 inhabitants each. Many descendants of the native tribe Huilliche live in its smaller villages and settlements. Thanks to its isolated location, Chiloe suffered less from the mainstream of Spanish colonial development. Chiloe is famous for salmon farming, its fine wooden churches, picturesque Palafitos (houses on stilts above the water), pristine beaches, dense cold rain forests, abundant fauna and flora. Huge areas are protected by national, regional or private parks. 250km North of Chiloe is the city of Valdivia, which has with more than 120,000 people approximately the same population like Chiloe. We came March 12th 2012 to Chiloe via the Panamericana (Ruta 5) and the usual ferry from Pargua. Close to Pargua is the pretty fishing port Maulin. An elderly man of a hardware shop asked us to come in. He showed us a beautiful hall in the building and he explained a lot of his history. Fortunately he spoke some German because his origin is the coast of Germany. Ancud has a nice main square with weird figures of the Huilliche mythology. Castro is famous for its picturesque Palafitos, buildings which are built on stilts above the water of the Pacific Ocean. Chiloe is famous for its colorful wooden churches in nearly every bigger settlement. The National Park of Chiloe is on the wild and remote western side of the island, divided into two sections. There is a superb hiking trip in the northern section Chepu along the Huevil and Ahuenco beaches of approximately one day. First you have to cross the wide river Rio Chepu with a boat. We shared the costs with four other Germans and walked the tour with Claudia, Simone and Mathäus from Bavaria. We had a lot of fun - Thank you very much. The southern part Cucao of the National Park Chiloe provides stunning beaches and dense and thick cold rainforests in the back of the Pacific Ocean. We found the pleasant campsite Papa (GPS coordinates S42°36.436' W74°06.523') managed by an eldery Lady, where the trails to the beaches and to the viewpoint Cerro Huelde start. Our track to Cerro Huelde is included in the GPS coordinates file of Chile. Valdivia is supposed to be one of the most beautiful city in Chile - we truly confirm it. It is a bustling economic center with an important university in a marvelous environment situated close of the estuary of the river Rio Valdivia into the Pacific Ocean. 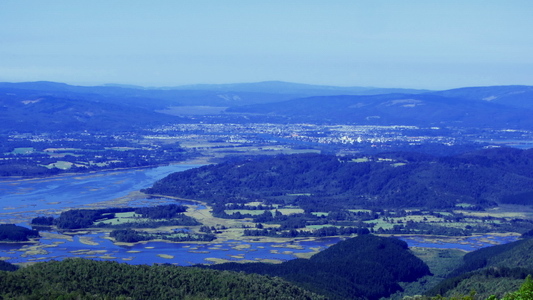 The environment of Valdivia is famous for its beaches, rivers, swamps, cold rain forests and ancient forts. Outstanding is the regional park Oncol with a good campground and nice trails (GPS coordinates: S39° 42.174' W73° 18.634'). Our track to Cima Oncol is included in the GPS coordinates file of Chile. North of Valdivia is Mapuche country, the aborigines of southern Chile and Argentina. They live in beautiful little villages and communities. They farm the land with cows, pigs, different kinds of crops and corns.